Blogging, Teaching and Second Grade... Oh My! Hello, after a few months of silence I am back. I never anticipated how stressful, tiring and hectic my first term of teaching would be! But to my amazement, I made my way through it and am now into my second week of term 2, and while I am still tired, I seem to be functioning a bit better. My kids are also loving the calendar, especially the I wonder questions. We have a new one each monday and each day I change the question a little bit or make it a bit more specific (i.e. make up your own etc). Such a great way to get them thinking and then speaking and listening. They are probably my 2 favourite things from everything that I made ready for the year, the noise monitor is great and I have noise monitors, but I still have to remind them a lot and motivate them with the behaviour chart. 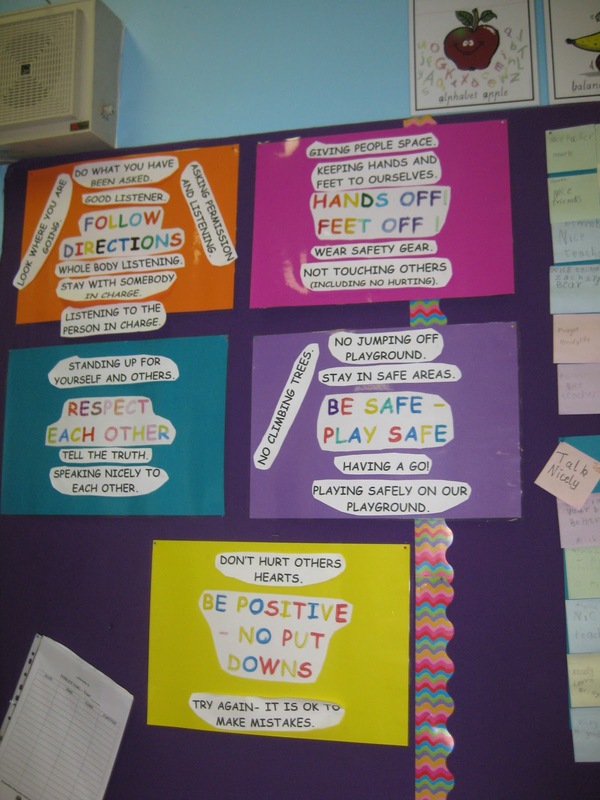 One great way to start the year was to go over the school rules and have a big chat about what they meant. Students brainstormed each rule. I typed them up put them on the floor and students came out, chose one and explained which rule it belonged on (as some could have gone on a few). It was a great way for students to really explain why we have rules. Another interesting thing that we did was our inquiry topic of 'rules'. We ended up making posters about sun, water and road safety. We also learnt how to play snakes and ladders, wrote a procedure and made up our own with safe (bottom of ladders) and unsafe rules (top of snakes) in it. The kids had such a great time making these and playing them with their parents on our showcase night. HAHA me too! I really am thinking of going in Wednesday to do a few things... I really want to make that flower clock! Glad to hear that your term went so well! It looks like you had so many amazing things planned for your class :) Keep up with the updates, it is great to see how your class is coming along. Best wishes from Manitoba, Canada! Yes will be more on top of the blog this term, hopefully Ill have some great things to share! I've always thought it would be amazing to visit Australia and New Zealand and sit in classrooms for several weeks. I think it must be Marie Clay's influence on me. Glad to hear things are going well. I'm excited to get to know you. Thanks Emily, you are so sweet!!! Hopefully you get to come to Australia one day, and hopefully I get to go to America one day! I so remember the first year teaching! Man... nothing can prepare you! But the good news: you're past the worst part! Yay! It all gets easier from here on out. Looks like you're doing some fun things! I'm excited to have an Australian blogging friend. Welcome to my blog. I teach grade 2 and I am now in my second year of teaching!!! Welcome to Mrs Thorburn's classroom blog! Something Old, Lots of New!! Just a Little Something Inspired by Pinterest! One, Two.... What do I do! ?